In 2014 The National Federation of Plus Areas offers an opportunity to its members to be surprised by a land of drama. Previous Anglesey Walking Weekends were praised by participants for the organisation and facilities and we are once again pleased to announce the organisation of the Anglesey Walking Weekend. 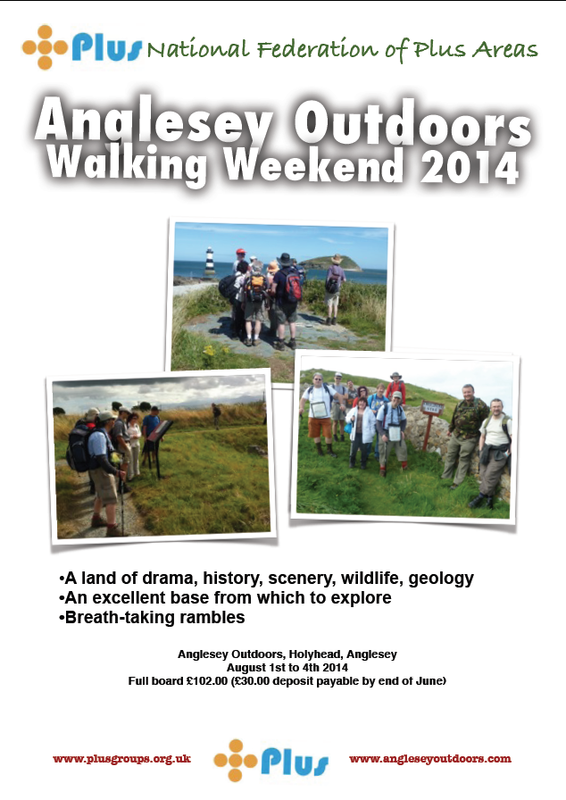 This provides an excellent opportunity to explore Anglesey and North Wales. Accommodation is a bunkhouse with full board in a coastal part of Anglesey near Holyhead. This provides an excellent base to explore the countryside around North Wales. A number of breathtaking rambles are planned, giving the opportunity to explore the Isle. The terrain and weather is varied so please bring walking boots and clothing layers to cope with a rainy summer. Satellite navigation will get a person so far in North Wales. Please use the internet to research your route. Booking Contact: Corinna Teale 7 Bedford Drive, Sutton Coldfield, Birmingham. We have secured twenty spaces, but welcome early bookings to ensure that the Centre can be occupied wholly by Plus members. If you have any questions about this event and the content please do not hesitate to contact me or John Smith.